Looking for a Unique and Fun Team Building Event to Build Teamwork? So what is the Next Big Fun Team Building Event? Over the last couple of years, we’ve been beta testing our new Ace Race Team Building Event, and we have gotten more positive accolades about this program than any other program that we have ever created. 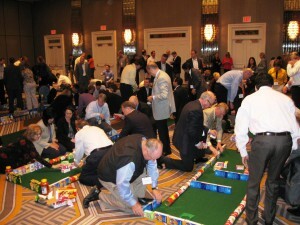 In this event, team compete with each other to create miniature golf course holes in a banquet hall. There are a couple of twists in the activity, though. 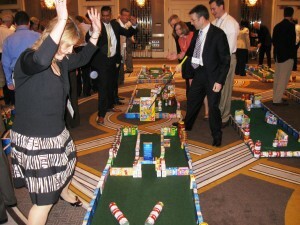 First, each hole is made out of non-perishable food items like canned goods and boxes of macaroni and cheese, so at the end of the event, the items are donated to a local food bank. The second twist? The competitive nature of the teams (human nature) makes each team want to create elaborate and challenging holes, but the reason that the event is called the “Ace Race” is that each team is playing a scramble to get a hole-in-one on each hole, not to get the lowest score. “Scramble” is a good term, because once teams figure out the real goal of the course, they have to scramble together to alter their hole before time runs out. Participants laugh and cheer throughout the final “competition,” and they have an absolute blast. Looking for something absolutely different? Something your team has never done before? We can pretty much guarantee that when your group wakes up the day of your convention that they will not, in any way, think they will be building a miniature golf course. But they will be absolutely glad that they did. In a resent Ace Race, Pfizer ended up donating almost a half-ton of food to City Meals on Wheels in New York City. The executive director of the charity was extremely grateful for the donation. If you want to get accolades from your group and do something good for your community, the Ace Race is the next big thing in team building, and your group will absolutely LOVE IT! For information, complete the form below. Get a Quick Quote within Minutes by using the form below.